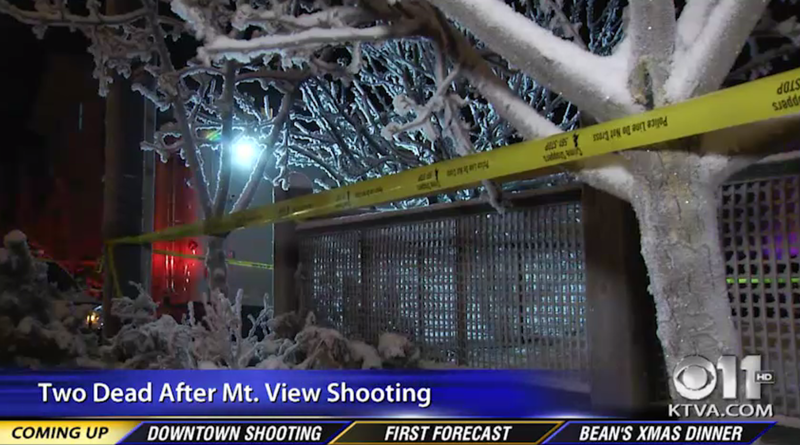 ANCHORAGE, Alaska -- One man was arraigned in court Sunday for a Christmas Eve double homicide, and court documents state another suspect is in the hospital and Anchorage police are seeking a third suspect who is considered to be armed and dangerous, CBS affiliate KTVA reports. Anchorage police Sunday announced the arrest of Jaylyn Franklin in the deaths of Danielle Brooks, 32, and Christopher Brooks, 38. Franklin appeared in court on Christmas Day. De Anthony Malik Harris was in the hospital being treated for a gunshot wound, according to the affidavit. The shootings were witnessed by a 6-year-old child who told police, “Ninjas came to my home and killed my family.” Police did not release the relationship between the child and the couple. A warrant has been issued for the suspected gunman. Police are seeking 22-year-old Lamarkus Jayquann Mann and say he is armed and dangerous. APD received a call just before 4 p.m. Dec. 24 from a passerby who said someone had just been shot, according to the affidavit. When police arrived on scene, they found Christopher Brooks on the ground outside of the apartment building. The man had several gunshot wounds, including one shot to the head, the affidavit states. He was taken to the hospital where he later died. A witness told police he heard shots and saw three men, dressed in black, running from the home. Around 4:30 p.m. a local hospital reported that a man, identified in the affidavit as Harris, had been dropped off with a gunshot wound. Officers interviewed Harris at the hospital. He said he had been walking in the area with his friend, Franklin, when he was shot in the leg. “He was vague in details of the events,” the affidavit reads. The document states police made contact with Franklin, who gave several versions of what happened. Initially, Franklin told police he and Harris were walking to the Holiday station when they found a man who had been shot. In a later interview, Franklin told police that he and Harris met Mann, and another unnamed man, earlier in the afternoon. Franklin said Mann asked the two friends “if they wanted to make money, and introduced them to a plan to steal drugs and money from the victim,” the affidavit states. Franklin said Mann told them that Christopher Brooks was expecting the 22-year-old to come over. The unnamed man, whom Franklin said he didn’t know, drove them to an alleyway near the Brooks’ home and the three walked the rest of the way, the document reads. “[Franklin] said they stopped on the south side of the apartment complex to cover their faces with t-shirts (sic),” the affidavit states. The three men entered the home, Franklin said, and he and Harris waited in the living room with Danielle Brooks while Mann took Christopher Brooks into a bedroom. When the two emerged, Mann “began demanding drugs and money,” the document states. Franklin told APD that Christopher Brooks pleaded with Mann to take what he wanted. Police and court documents say a scuffle began, as Mann and Christopher Brooks wrestled for the gun. Franklin said Harris appeared to try to help Mann in the fight, which he told police is when he thinks Harris was accidentally shot. Franklin stated Mann then shot Christopher Brooks several times and then shot Danielle Brooks. According to the affidavit, Franklin told police Mann likely shot Danielle Brooks because she was a witness. Though he said both Mann and Harris had guns during the robbery, Franklin states in the court document that Mann was the only person to shoot. The affidavit and police stated the three then fled the scene in a vehicle, which court documents say was a Honda Ridgeline. Franklin admitted to police that he erased text messages about the homicide. Franklin is charged with first-degree robbery, first-degree burglary, tampering with evidence and two counts of second-degree murder. On Sunday, the judge set his bail at $100,000. Harris and Mann are both charged with first-degree robbery, first-degree burglary and two counts of second-degree murder.